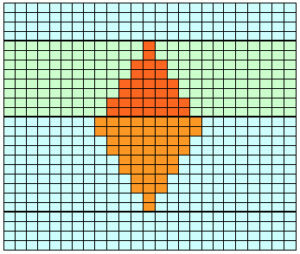 Picture knitting / intarsia may at times be achieved using holding techniques. 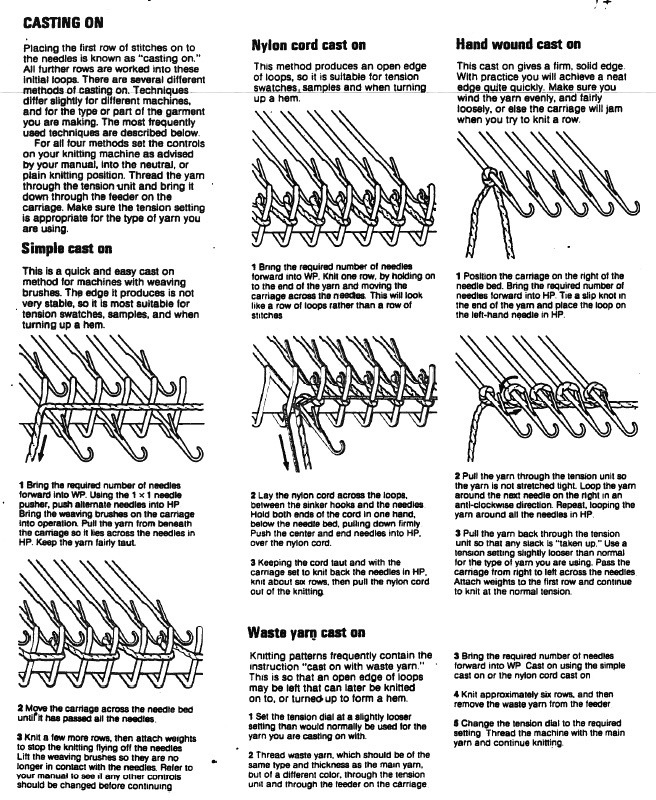 As in any such knitting, supplies include extras such as bobbins, clothespins or weighted clips, but no separate carriage. 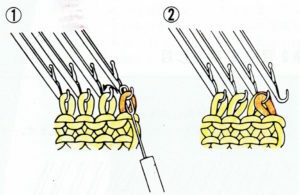 If the ribber is in use and one is working on a large piece, ribber covers allow the yarns to hang in front of the ribber bed. 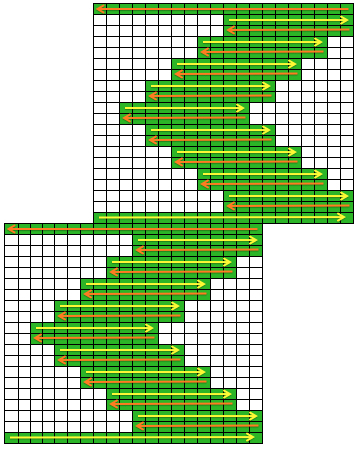 Some of the rules for accomplishing this using short rows: it is helpful to work from a chart. 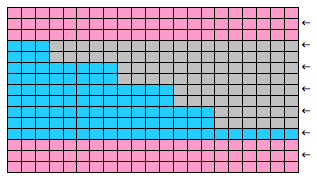 Two row sequences are required, so having the working chart double length makes the process easier to visualize. 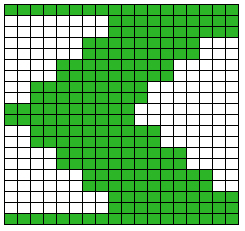 “Follow” knitting direction with any tool to determine that the pattern is executable, with no long floats or slits. 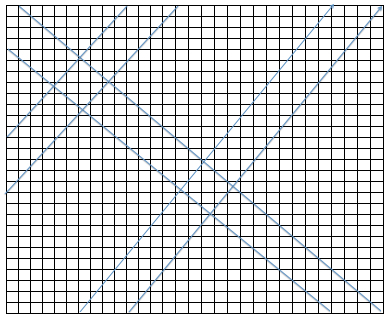 The bottom of any diagonal lines is always knit first. 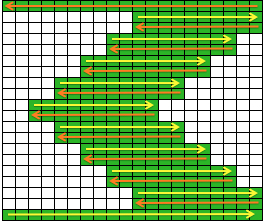 Needles are brought out to hold on the carriage side, pushed back into work opposite the carriage; one exception to this rule is if “automatic wrapping” is used. In the latter one less needle is brought into hold than needed opposite the carriage, the row is knit, then with the carriage on the alternate side the first needle in hold next to stitches just knit is brought out to hold, resulting in a “wrap” and correcting the count to the desired number. 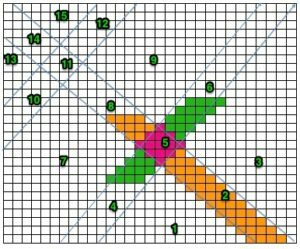 Any number of needles may be pushed back into work at any time. 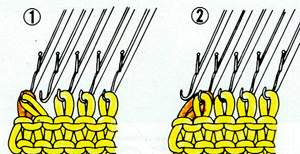 More than single stitches brought to hold on the carriage side will produce floats. 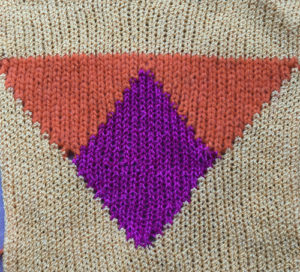 When knitting shapes the only needles in work are those being worked to create that shape. 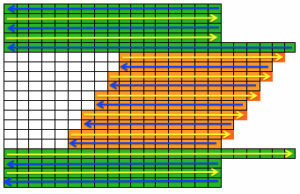 Base rows of knitting, whether in waste yarn or as part of the pattern, are needed prior to working in hold. 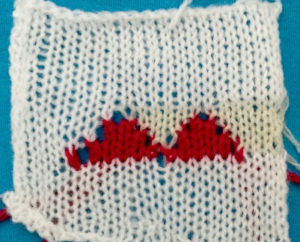 Remember that you are working on the purl side, so any image will be flipped horizontally on the knit side. 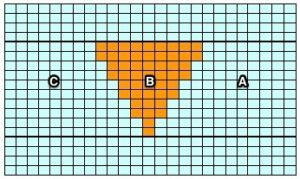 Reverse chart horizontally before working it if direction matters. 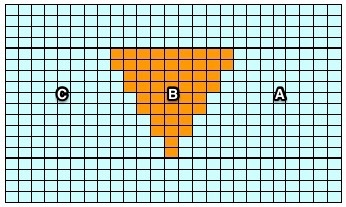 Begin with a simple shape. Letters indicate knitting sequence for short row sections. 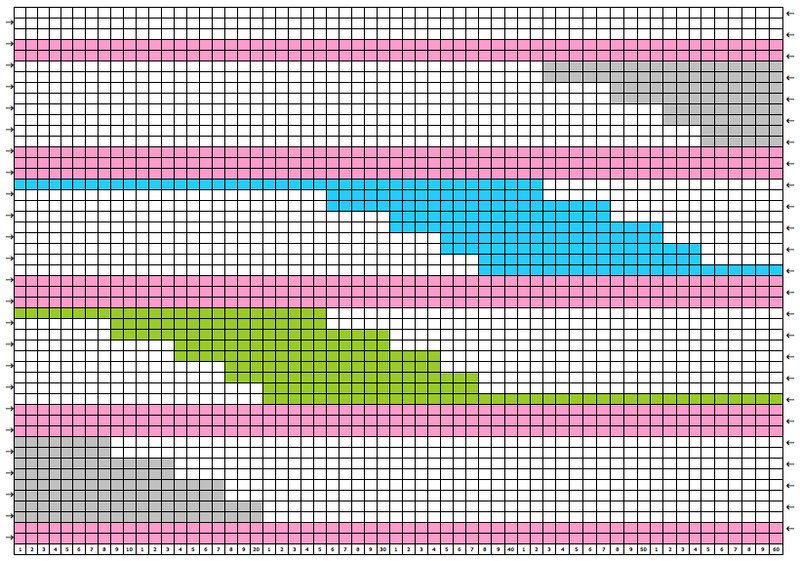 Patterning in these charts begins with COR, bold lines separate areas of plain knitting, letters indicate order for executing short row segments. The fabric produced lies flat, with no noticeable 3D protrusions. 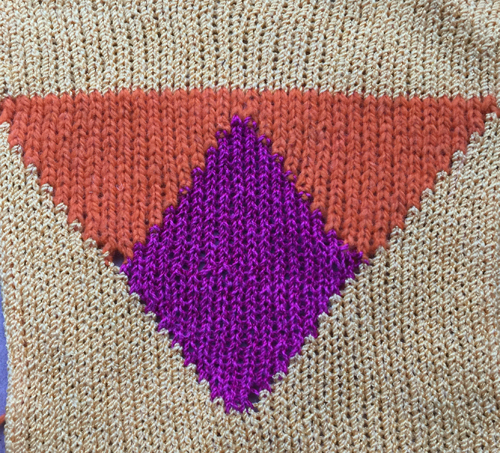 I find it helpful to use familiar yarn and to work variations of a familiar shape prior to taking on more complex patterns. 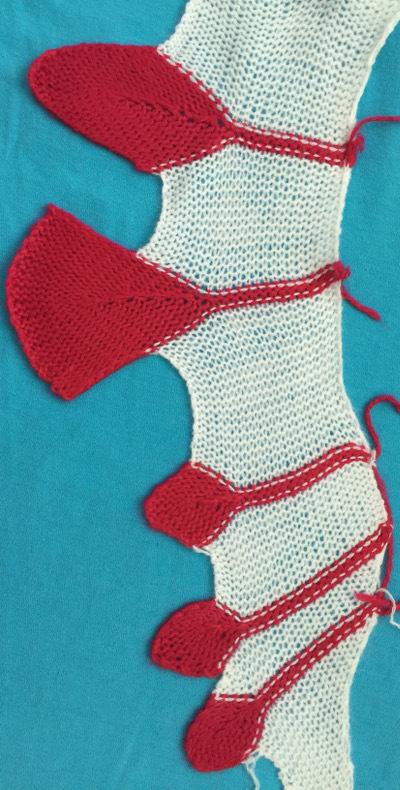 Below is a cousin of the first shape illustrated in this post, with pattern worked beginning COL, repeated across the row, increments in number of stitches worked in short rows, but mirrorred on both shape sides (shown in first swatch segment). 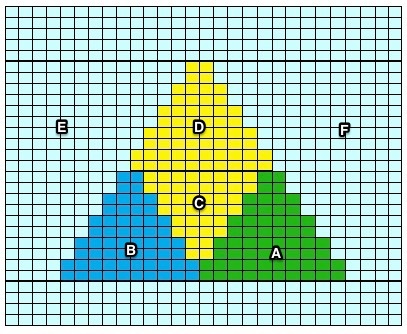 Some of the same shapes may be placed on a shaped edge. 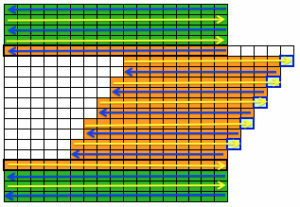 The repeat will likely need some editing; arrows indicate direction of knitting for that row. If the background color is used for casting on and binding off, then the isolated shape floats on the ground, and the horizontal line of contrast color is eliminated. the yarn used is an acrylic, so pressing helps to make the shapes lie flat. 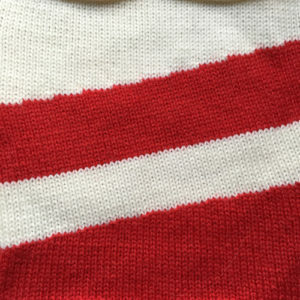 Once again, using wool or any other yarn with “memory” will result in considerable curl at side ant top and bottom of knit piece, so that is a consideration in putting in the effort. 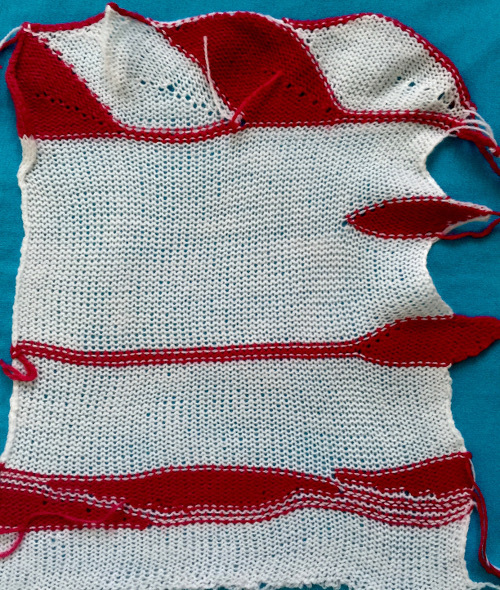 The more striping, the more yarn ends to weave in and row counts to watch. 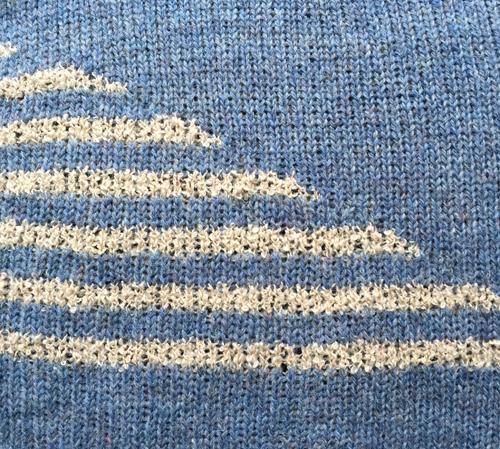 Using space dyed or sock yarns may produce pleasing though unplanned stripe patterns in any of the shapes. 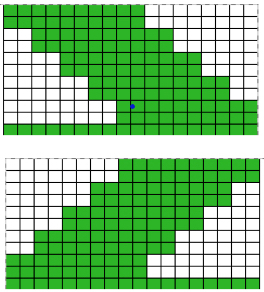 My samples are not resolved final fabrics. There are many inspiring patterns available for purchase or at times free on the internet for hand knitting, usually in garter stitch as well as holding, resulting in a nearly square gauge, flat lying knit. 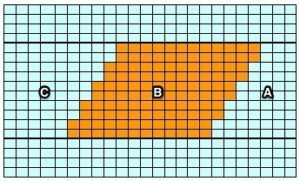 Taking it to garments: accessories are easiest, since gauge may not be significant. 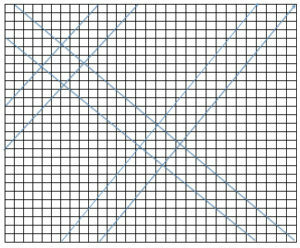 Shawl shapes in HK are often knit on circular needles, without the constraint of the fixed number of needles on any particular model KM. 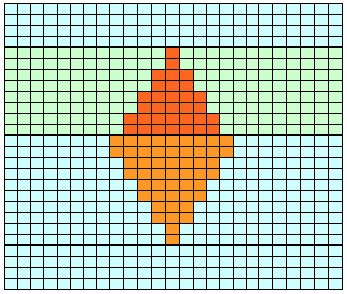 Sometimes, with adjustments, the same shapes may be rotated sideways on the KM. Segment sizes may differ due to the resulting change in gauge. 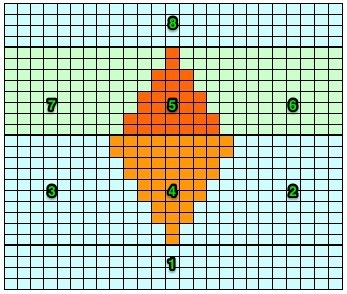 Sampling techniques and shapes in smaller versions helps work out the kinks. A simple decrease occurs when the last stitch on either side is transferred moving away from the carriage, the empty needle is placed out of work, and the row is knit. 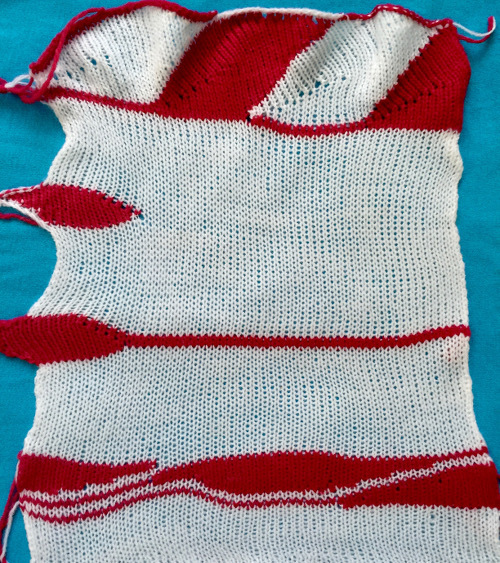 This illustration shows a fully fashioned version, which gives an edge that makes seaming easier and more attractive, and eliminates the small bumps usually seen along decrease edges, the process adds to knitting time involved in finishing the piece. 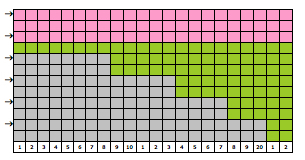 Decreases may be made on every row. 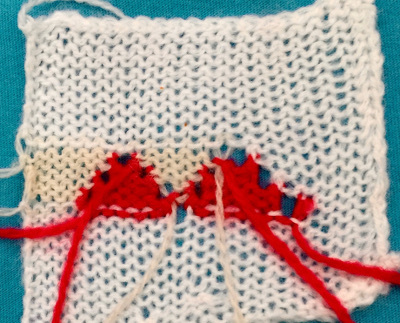 *COR: bring an empty needle into work on the carriage side, knit a row. 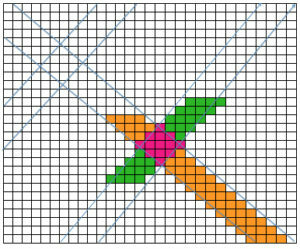 Insert transfer tool into loop created as shown, turn toward carriage (in this case clockwise), essentially creating an e wrap, hang on adjacent empty needle hook. 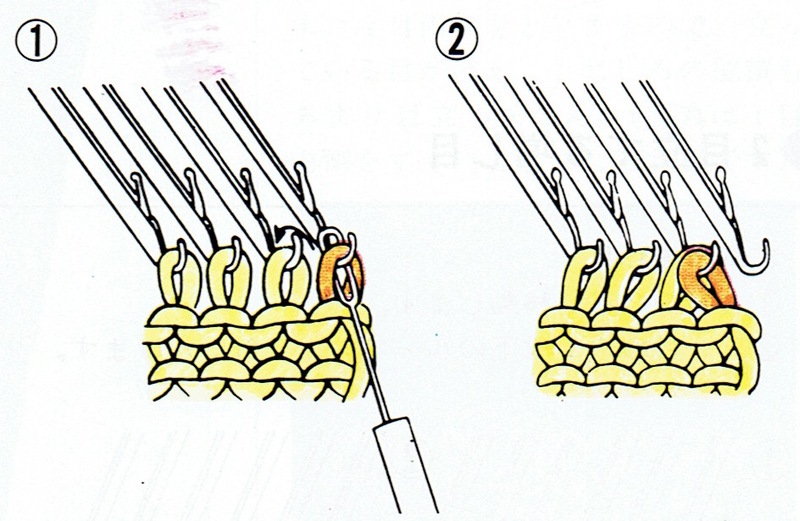 pw2: picking up wraps and knitting them together happens when needles with wrapped loop and stitch behind it are brought back into work. Terminology may vary in self published patterns, some are accompanied by very good tutorials. 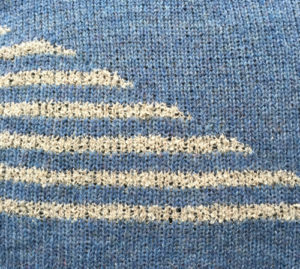 Ravelry HK searches can provide inspiration for many a holding technique variations. 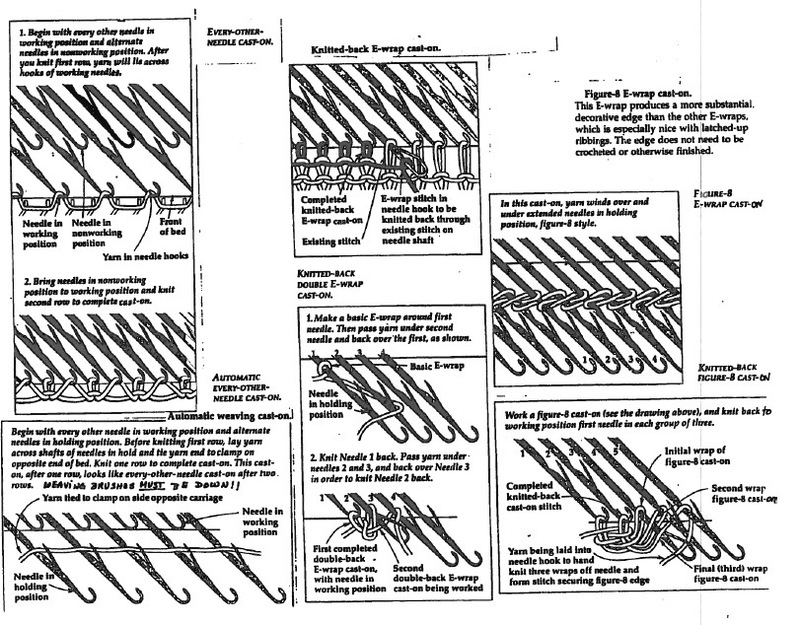 Other terms to look for in image and pattern searches include swing knitting, and on occasion, tapestry knitting.